Latest entry in history simulation game series revealed. 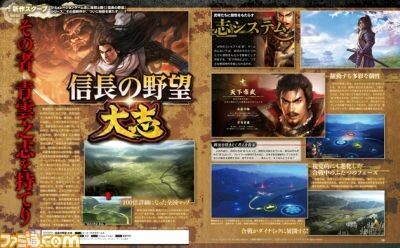 The latest issue of Weekly Famitsu reveals Nobunaga’s Ambition: Taishi, the latest entry in the history simulation game series Nobunaga’s Ambition for PlayStation 4, Switch, and PC. Just as the subtitle “Taishi,” or “Aspiration,” suggests, Nobunaga’s Ambition: Taishi puts the spotlight on the “will” of each warlord. Update 8:55 a.m.: Nobunaga’s Ambition: Taishi is due out in Japan this winter. The 3D maps that were popular in the previous game are more detailed, and the nationwide maps are 100 times more detailed. Will System – Each character has a “Will.” This “Will” means “way of life,” and indicates how the warlords will act. Since each warlord’s Will is different, how to proceed the game will also change. Will also influences the commands you choose and specific tactics. Two Phases of Battle – Battles consist of “Command Phases” and “Advance Phases.” You can calmly think about what you want to do without rushing to take action during the Command Phase, during which time is stopped. Evolution of AI – Daimyo AI have will-associated goals. In diplomacy, there is also multilateral judgment based on will. The Greatest Number of Warlords – In Nobunaga’s Ambition: Sphere of Influence – Ascension, more than 2,000 warlords appeared. In this title, the number of warlords appearing will be of the same scale. We wanted to you to taste the feeling of being against people, which was the basic design of Taishi. The will system was born from there. Partway through the final goal set for each daimyo, if he is judged to be “harmful,” he will be seen as an enemy. Then you’ll have to act according to that will. There are plans to include new elements on the battle side. Up until now, stocking up on lots of territory, troops, and vassals equaled strength, but this time, we are using a system where the level of power exhibited will change based on the compatibility between the daimyo and vassals’ Wills. Development is currently 20 percent complete.